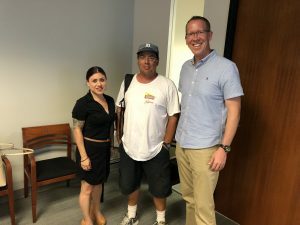 On this episode of ‘Homeless in San Diego: Real People, Real Stories’ host Greg Anglea, CEO of Interfaith Community Services, is joined by Anne Rios, Executive Director and Managing Attorney of Think Dignity, a grassroots agency working hands-on with homeless individuals, developing creative solutions to meet their needs appropriately. Founded twelve years ago, Think Dignity operates a variety of programs including a storage center, mobile showers, a street boutique for women, legal clinics, pop-up cafes and farmer’s markets, and more. Anne and Greg are then joined by David, who brings a unique perspective to the episode – given that he is still living on the streets. Having once received services from Think Dignity, David now works for the agency, operating the truck and trailers for all mobile programs. David details his struggle with homelessness, including his ongoing journey to find a home. Support organizations like Think Dignity, Interfaith Community Services, and South Bay Community Services by volunteering or giving a monetary donation. These donations can go towards rental assistance, purchasing household items to furnish formerly individuals’ homes, and more. Find out about different ordinances that are criminalizing homeless individuals by visiting Think Dignity’s website and if you are compelled, talk with your County Board of Supervisors and Police Chief about what the plan to do about homelessness in a humane and dignified way.